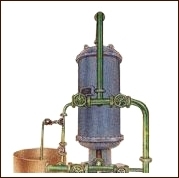 The Industrial Softeners is a manually operated unit designed specially for industrial use. It is simple to operate, inexpensive to maintain and is widely used in the industry. The softener comprises Steel /FRP pressure vessels containing a bed of cation exchange resin, a regenerating system and control valves. A strongly acidic cation exchange resin in sodium form is used to exchange sodium ions for the hardness �forming calcium and magnesium ions, and thus produce soft water . At the end of each service cycle, the ion exchange resin is regenerated with sodium chloride solution, after which the units is ready for the next service cycle. For larger plants, a brine measuring tank is provided, and a separate salt saturator, preferably in concrete, is recommended for bulk storage of salt and preparation of brine. Standard equipments is available to soften water, upto a maximum flow rate of 275m3/h. � The series of softeners are attractive, compact, easy to operate & maintain, & use international quality materials of construction, introduced for the first time in India. � Softeners are available in MS, MSRL, FRP, operating in Manual / Auto mode. � Easy to install and operate. � Produces clear ,soft and non � scale forming water. � Incorporates high-capacity polystyrene bead type cation exchange resin which is remarkably stable and has a long life. � Hospitals, hotels, laundries & air-conditioning plants. � One set of control valves, with all piping to inlet and outlet terminals. � One combined salt tank/brine measuring tank, provided with brine suction piping with adjustable indicating clamps, hydraulic ejector and control valves. � One charge of softener cat ion exchange resin with supporting under bed. � One hardness test kit for testing the softened water.